“Perfect, exactly what I needed. Now we are taking the next step forward. 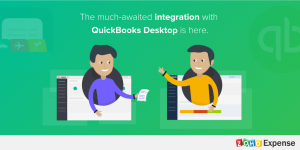 We bring you the much-awaited Zoho Expense-QuickBooks Desktop integration. We’ve joined the two apps using an in-house connector so you don’t have to juggle between programs anymore. No more double work for the finance team. Zoho Expense brings all of your approved expenses into QuickBooks Desktop as bills or credit card charges, so it’s easy to convert them into invoices and bill your customers right away. Know where exactly your money is going. Consistency makes work easier. Bring your expense accounts to Zoho Expense in a single click (or import them in a .csv — whatever’s easiest for you), so that you and your employees can select the categories you are familiar with. It also makes exporting much more convenient. Zoho Expense automatically matches all of your expenses to the correct expense accounts, so you don’t have to manually categorize them in QuickBooks. Bring your Classes from QuickBooks into Zoho Expense too, as Tags. Whether you want to sort your expenses by cost centers, conferences, or project types, giving your employees the right options to choose from is essential for keeping your expenses organized. Bring your employees and customers from QuickBooks Desktop into Zoho Expense instantly. Next time your account manager goes to visit a client, they can record their trip expenses right away using the Zoho Expense mobile application and mark them as billable to your customer. There’s no manual matching to delay the approval and reimbursement process. Even well-organized expenses benefit from a different view occasionally. With Zoho Expense’s insightful analytics, you can drill down into your company’s spending. Find out which cost centers are spending the most, and where exactly they’re spending it, so you can make the right budget decisions. Would you like to see the integration in action? Reserve your spot for the webinar and join us to see how it all works. Can’t wait to give it a try? Email support[at]zohoexpense[dot]com, and we’ll send you the link to download the connector right away!